Want a kitchen hack that will boost the flavor of dozens of recipes and keep things healthy and diabetes-friendly? Use homemade chicken stock wherever you can. Swap it out for store-bought in recipes that call for broth or stock; substitute it for water when boiling veggies or grains; or use it in soups, stews, and chilis. You’ll be amazed at how much flavor it adds to a recipe, and by preparing it at home you can cut the sodium without cutting taste. If you’re intimidated by the thought of making stock at home, don’t be. It’s very simple, and the payoff is absolutely worth it. Not only can you build your own flavor with homemade stock, you also have control over how much salt is added. Store bought stocks are often very high in sodium. While the reduced sodium varieties are a better option if you’re watching your salt intake, even those can still have a lot of sodium. When you make your own stock, you can leave out the salt, and wait to add seasonings to the final dish. And let’s not forget about the cost savings: homemade stock costs $0.00 when you make it from scraps that are destined for the trash! In my house, we eat roast chicken at least once a week, and I make stock from the bones every time. In its simplest form, all it takes is chicken bones and water. If you want more flavor, go ahead and throw in a mixture of basic vegetables like onions, carrots, and celery. Herbs? Sure! Those parsley stems are full of flavor, so why throw them away? Throw them in the pot! You can save vegetable scraps over time—instead of tossing them in the trash, keep them in an airtight container in the freezer until you are ready to make a batch of stock. Stock vs. Broth: Generally, "stock" is made with bones and cooked for a much longer time to get collagen out of the bones, while "broth" is made with just meat and vegetables and cooked for a shorter time. When I make chicken stock, I simmer it for 30 to 45 minutes. But if I’m making vegetable or mushroom stock, I make it on the fly, letting vegetable scraps and herbs simmer for as little as 10 minutes while I prep the rest of my recipe. No matter which stock you decide to try, you can always make a big batch and freeze it for later. Brown the bones (or vegetables, or mushrooms) with a little bit of oil in a large stockpot, making sure to develop crusty bits on the bottom of the pan (those bits will give your stock a major flavor boost). Add cold water (it has to be cold), enough to cover the ingredients, and stir, being sure to scrape all of the crusty bits from the bottom of the pan with your spoon. Bring to a boil, then lower the heat and simmer gently. You never want to boil a stock violently, you want to simmer it low and slow. For chicken stock, simmer for at least 30-45 minutes, and up to 2 hours, depending on the amount of bones. Mushroom or vegetable stock only needs to simmer 10-30 minutes. Let the broth cool, then strain through a fine mesh strainer. Store in airtight containers in the fridge for 3 days, or in the freezer for 3 months. Check on the stock occasionally and skim off any foam that accumulates on top. Otherwise, your stock could taste slightly bitter. Be sure to strain the liquid really well, using a very fine strainer (called chinois), or a wire mesh strainer lined with cheese cloth, as the pieces of food left in the liquid may spoil the flavor. 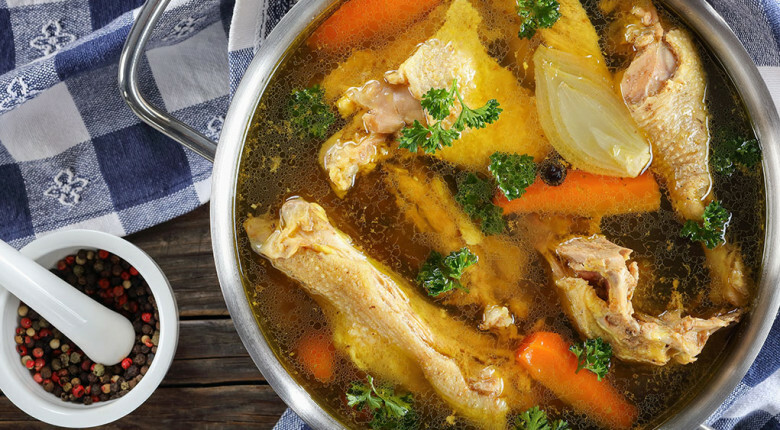 In the case of chicken stock, I am not too picky if there are little bits of meat left on the bones, but generally speaking, you want the bones to be clean of meat. The bones are the source of the precious gelatin and flavor, not the meat. Once you start making stock frequently, it gets easier! Try using your homemade stock in your favorite soup recipe, or try my recipe for Caldo Verde and experience the difference for yourself!